Intrepid Group's FAM Trips 2019 have just landed with three released FAMs and our Mystery Trip now revealed. Which trip will you travel on? 1. Enter your details in the registration form linked to your chosen trip (each trip has its own form). 2. Register for the matching mandatory 30-minute webinar and join your Intrepid Group PGM's to learn more about the travel region. 3. Fill out the mandatory post-webinar questionnaire. Application deadline is the day of each live webinar. Successful applicants will be notified a minimum of 90 days prior to the FAM departure. Registrations for our Mexico Real Food Adventure FAM have now closed and winners have been announced. Keep scrolling to see which FAMs are still open! 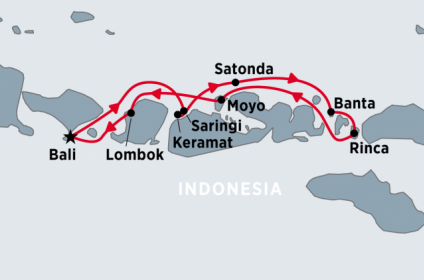 Registrations for our Indonesia Adventure Cruising FAM have now closed. If you registered and missed the webinar please ensure you have watched the recording by 29 March, 2019 to remain eligible. The COMPULSORY post webinar survey can be found here. By Registering for Kenya FAM I agree to the FAM rules and to receive email communications from Intrepid Group. Details released, check them out now! Jump over to our Agent Dedicated Facebook Group- Intrepid Group Insiders and let us know how fired up you are about this years FAM offerings! Any guesses on our Mystery FAM? Post on the page and see what others are guessing! Registered? Excited? Let us know what you think. Join the Intrepid Group Insiders today on Facebook for the latest deals, incentive updates and tools to help you sell Intrepid Group. NO PURCHASE NECESSARY. 1. Intrepid Group FAM trips cannot be redeemed for any alternate trip. 2. Application deadline is March 30, 2019. There will be no extension to the application period. 3. Participation fee applies:; $400 per Intrepid Travel FAM and $600 per Peregrine Adventures FAM. Participation fee is non-refundable and non-transferable, and must be paid in full before participation is confirmed by Intrepid Group. This fee cannot be paid with Intrpeid Bucks. 4. Recipient must be employed full time as a travel agent or in the travel industry at the time of travel to participate in FAM trip. 5. Return airfare not included. 6. To be eligible, entrant must register for and watch a scheduled webinars linked to the FAM trips and answer follow-up questionnaire. Registration details can be found on the contest page. 7. This offer is not transferable and can not be redeemed for cash. 8. This offer does not include travel insurance, transfers, extra accommodation pre or post, visas etc. unless otherwise specified. 9. Intrepid Group of brands Booking Conditions will apply to the free trip booked, and it is imperative that you examine those Booking Conditions before booking on an Intrepid Group tour. The most up to date Booking Conditions are accessible on our brand websites www.intrepidtravel.com/booking-intrepid/booking-conditions . 10. As outlined in the Intrepid Group of brands Booking Conditions, travel insurance is compulsory for all Intrepid Group travelers and should be taken out prior to or at the time of booking. Please see the Booking Conditions for more details in this regard. 11. The trip is subject to availability and confirmation by Intrepid Group at the time of booking.